In six seasons as a Liverpool player, Glen Johnson made 160 Premier League appearances. He scored eight league goals for the Reds and provided 10 assists. 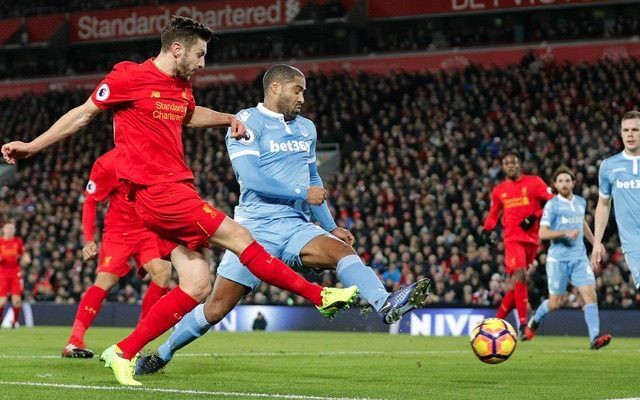 Johnson now plays for Stoke, but he added to his tally of Liverpool assists on Tuesday by setting up Adam Lallana at Anfield. Presented with a easy chance to clear from his penalty area, Johnson – perhaps a little confused – opted to prod the ball perfectly into the path of Lallana who slid home to give the Reds an equaliser to cancel out Jonathan Walters’s early opener. Lallana has now scored four goals in his last four games for Liverpool. The midfielder also netted twice for England in November, meaning he has scored six times in six matches for club and country. This match was Johnston’s 34th in the Premier League for Stoke. He has yet to score, but has three assists to his name, not including goals created for opposition players!